Rooted in ancient warfare and trailblazing, we offer a unique opportunity to tap into your primal and wildly adventurous self. Imagine a game of darts but done with axes and being more extreme and exciting. Overall 5-star rating by customers throughout various review sites. You will arrange your own transportation to get to AxeVentures. We have a parking lot if you're driving. Upon arrival, you will check in and sign a waiver. 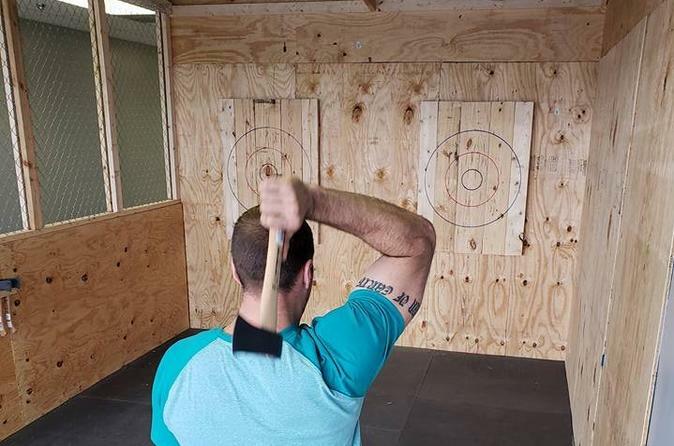 A coach will teach you the techniques of axe throwing, which includes various techniques. After which, you and your group will have sometime to practice throwing. After some practice, we have some competitive games setup for you and your group to play. Your experience is a total of 90 minutes but be sure to arrive 15 minutes early to check in and sign waivers. We start on time so any latecomers risk losing their spots. If you like, you can extend your time with additional payment. The facility has bathrooms and you can BYOB.